Living a green or eco-friendly lifestyle is still a mysterious concept to some people. It doesn’t have to be expensive and time consuming. Making a few small changes can go a long way in having a positive impact on the environment (and your wallet). Read on for some helpful and inexpensive tips to adopting a greener lifestyle. –Replace your incandescent light bulbs with compact fluorescent bulbs. It can get expensive to replace every single one in your house all at once, so replace them as the old light bulbs quit working. CFBs consume less energy and last up to 10 times longer than traditional light bulbs. –Recycle your old electronic items. Check with local government agencies or visit www.mygreenelectronics.org to locate recycling centers in your area. Think of all the chemicals and heavy metals that won’t go into the landfill. –Inspect your home for drafts where air from the outside can get inside your home and cause your heater and AC to kick on more frequently. Check around windows, doors, electrical sockets, light switches, door locks/knobs, and baseboards for leaks. Simple repairs can save you a bundle on your energy bill. –Plant a garden. 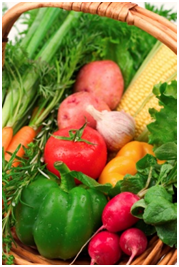 Not only do you save money, you don’t consume fresh vegetables treated with pesticides. If planting a garden isn’t possible, then visit your local farmer’s market. –Wash full loads of clothes. During warm weather, hang your clothes outside to dry. –Use real plates and utensils instead of paper at mealtime. –Eliminate the use of paper napkins/towels. We know this is probably a tough thing to do, but there are several options for you to save money and landfill space. Use cloth napkins at meals. Make use of those old socks and t-shirts collecting dust in the closet. Cut the end of a sock off and place your hand in it for a great duster. Old cotton t-shirts can clean glass and other surfaces. Microfiber cloths can absorb spills and be used for more heavy duty cleaning chores. All of these can be tossed into your regular laundry. If you must use paper towels on occasion, then choose those made from 100 percent recycled paper. Please feel free to share your own ideas here! We’re always happy to read about other ideas you have about going green!